/Why Is My Concrete Discoloring? As a Tulsa homeowner, you’re probably used to seeing concrete all around town. It’s a common building material in our climate, where it effectively endures the dual weather challenges of ice and heat. But if you own a concrete driveway, sidewalk or floor, you may have noticed an unusual issue arising over time — a strange, stained, or discolored look has begun to mar your beautiful concrete. Concrete problems like this can be upsetting, because concrete has a reputation for being strong, attractive, and durable. Homeowners and business owners alike invest in it precisely because they want a clean, low-maintenance look. So, discolored concrete is a concern. And concrete solutions are a must. 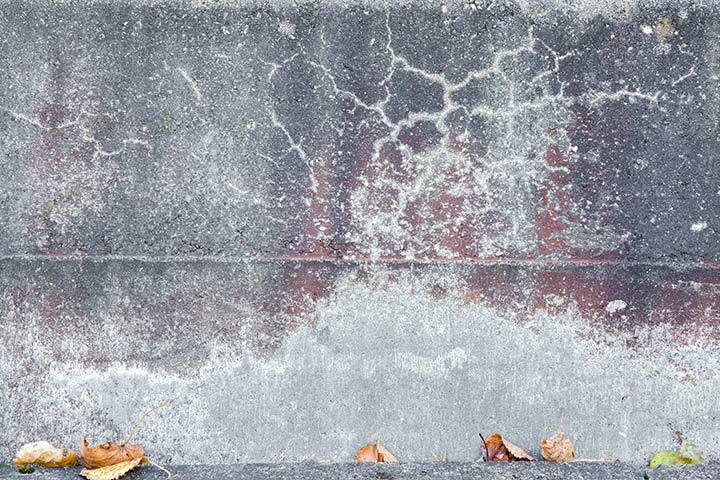 What leads to discolored concrete, and what can you do to address it when it occurs? Here’s a handy guide on what to do when this common concrete problem arises. Dark, blotchy appearance — When properly laid, concrete should look all the same shade, rather than showing dark blotches here and there. Light discolorations — Discolored concrete can also be seen in occasional patches of lighter than normal concrete in the overall surface. Incorrect shading — Because people expect concrete to be grey, other shades tend to stand out, for both good and bad reasons. Tinted concrete that doesn’t look like the color you requested can present a problem. The key to an attractive concrete surface is consistency. Each portion of concrete used must be mixed at the same proportions to create a matching look. To ensure that the many ingredients that go into concrete work together consistently well, your contractor should use only materials that adhere to American Society for Testing and Materials (ASTM) standards. Water — To make laying the concrete easy, some contractors add water to the mixture onsite. If not mixed properly, this modification can produce a blotchy look in your concrete. Calcium chloride —This substance is often added to speed the drying process. And if it’s not mixed in thoroughly, it will create blotches in the dried surface. Some contractors (and homeowners) may prefer to use recycled materials in the concrete mixture as a way to go green. These replacement substances perform differently than traditional concrete, so the color they yield may not match existing concrete as well as expected. Details in the laying, such as changing weather conditions from day to day, can affect how a concrete surface appears when dry. Expert concrete contractors adjust carefully for these issues to control the pour as much as possible. Failure to do so properly can lead to discolored concrete and other concrete problems. Uses materials that adhere to American Society for Testing and Materials (ASTM) standards. Performs a test pour so you can see how the concrete mixture will look in real life, rather than just how you think it might look. Establishes a uniform subgrade so that when the concrete is laid atop it, there is a higher likelihood of getting a consistent surface appearance. Doesn’t use calcium chloride or other chloride-bearing admixtures to speed the drying process. Adjusts adequately for changes in weather, including rain, heat, and cold. Limits the chances that sunlight or wind will cause the concrete surface to dry inconsistently. Avoids techniques like hard troweling, which can lead to discolorations. If you end up with discolored concrete, you’re not without options. There are some common fixes that just may solve your concrete problems and yield a surface that looks uniform in color and beauty. Cleansing — For mild discoloration, repeatedly flushing the hardened concrete surface with hot water, then scrubbing with a stiff brush, can reduce or remove discolored blotches. Acid treatment — If the discoloration is more severe, a mild acid solution of 1-3% muriatic acid to water can help remove the discoloration. Just be sure the mixture is mild and the procedure is performed carefully in small doses, or you may end up with blemishes or weakened concrete. Color staining — In certain instances, such as less severe discolorations, adding a tint to the hardened surface can hide some concrete problems. Specialty coating — A thin polymer-modified coating, which is often used to hide graffiti, can also be used to hide significant discolorations and stains. Laying pavers — A concrete surface can be dressed up with pavers that hide discoloration. A complete makeover — Sometimes, your concrete problems, including discolorations and stains, are so severe that repairs don’t work. In this case, a re-pouring of new concrete may be necessary. Whether you have existing concrete problems such as discolored concrete or damaged concrete that you’d like repaired, or whether you want a fresh new surface laid for you, we can help. We’ve worked with many Tulsa area homeowners to produce a uniform, beautiful, decorative concrete surface for driveways, pathways, and other areas. We concentrate on precision work that yields smooth, attractive results so you can be proud of every inch of your home’s concrete surfaces. Check out our Residential Concrete Services to learn more about how we can assist you, and call us at 918-809-2235 to request a free consultation and estimate.